Before you even begin investing in property you should know your exit strategy. 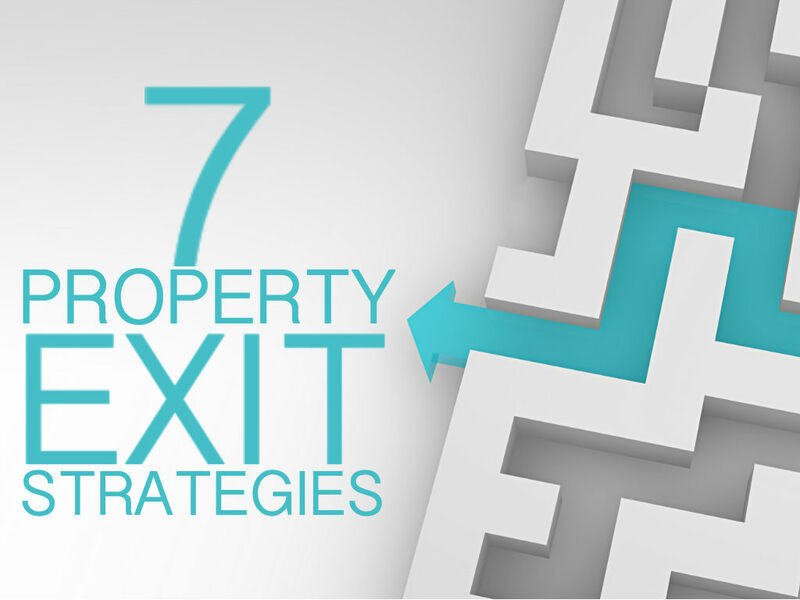 Here are 7 common property exit strategies used when investing in Australia. I actually got this question from Valerio who is a member of On Property Plus and he’s basically the best customer that I could ask for. He is so grateful for all the stuff that I have offered and he even bought me a book. Thank you Valerio for your support in what I’m doing here in trying to help people. He asked the question about exit strategies and how most people tend to exit out of the property market so I thought that would actually be a great idea for a podcast episode. 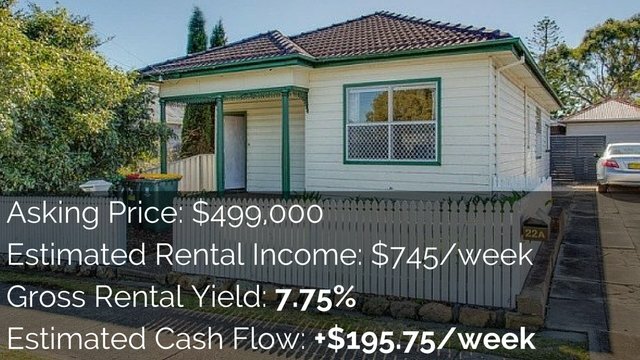 Therefore, we’re going to talk about the seven different exit strategies that most people use when investing in property in Australia. I suggest that you look through these different exit strategies and then decide which one is best for you. Do you want to be extremely wealthy? Do you just want to have a large pot of money? Do you want to have a large portion of equity or a large value kept up in the properties that you own? Where you want to end up will largely determine what type of exit strategy you might use. The first thing I am suggesting anyone does is to set your financial goals first. In Day 1 of the 30-Day Property Journey, I talked to you about how to set your Financial True North and set up financial goals. Before you start planning out an exit strategy it’s very important that you first have financial goals. Generally when you’re investing in property you’re going to want to have an exit strategy before you even start investing. This exit strategy may change over time as your investments change but if you go into the market knowing how you are going to come out (whether it’ll be in a couple of years or in 20 to 30 years) then it can really help you decide what investment is best for you. 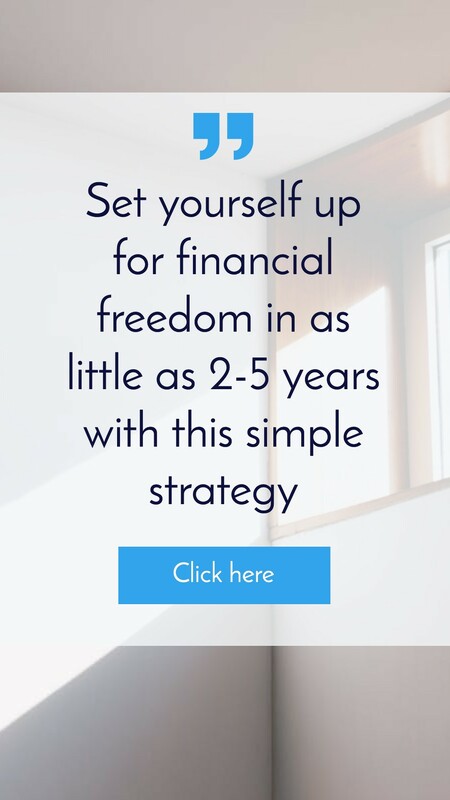 In one of the first modules created for On Property Plus I talked about analysing properties based on your financial goals and said that my goal is long-term financial freedom. I showed a property that had extremely high rental yield but it was in a mining town. Because my goal is long-term financial freedom then that’s probably not going to be the best investment for me because it’s possible that the mine might not be there in a few decades. So understanding your exit strategy and how you want to invest in the market before you go in can really help you make better decisions. What are the different investment strategies that we have that you could potentially use? So say you purchase a property and you assume a loan that is interest only. You then hopefully generate a passive income from this property. This could happen if you buy a positive cash flow property or even purchase a negatively geared property. But basically over time rent goes up and it becomes positively geared. This is a long-term strategy and all you do is you hold the properties. You don’t have a huge focus on paying down debt. Sure you may have a principal or interest loan over 25 or 30 years or you may have interest only loans but paying down debt is not your focus. Generating passive income above all the expenses of that property is your focus. What’s likely to happen over time is that your properties will increase in value. The rents will increase in value but your mortgage amount will stay relatively the same. As these rents go up and your mortgage stays the same your passive income begins to increase. If you are only making $10 per week in passive income after all of your expenses and your property goes up $10 per week in rent, chances are your expenses won’t change significantly so most of that $10 increase would actually be profit. So you are going from $10 passive income to $20 passive income. Twice as much without paying down any debt. So that is one strategy that people use. They just buy properties, maybe pay down debt slowly but it’s not a huge focus on because it doesn’t matter. The main focus in this method is to generate a passive income to have financial freedom. With this option you want to have a huge focus on paying down your debt. Therefore during your working life you may be heavily focused on reducing your mortgage. Most likely you would be funneling all the passive income that comes from the property into paying down those mortgages with the goal that you will own your properties outright with no debts on them. Then you’ll just collect the rents and that will be your passive income. It is very similar to the first strategy. However you have decided that you actually don’t want debt in your life and therefore you want to pay down debt so that you can own your properties outright and basically not have any worries about the banks calling for your loans. This is the strategy where people actually borrow more money in order to live off that money. So rather than living off of passive income (which is generated from the rents) you are actually living off capital growth. The goal therefore is that you own multiple properties over time, the properties go up in value and you can then draw portions of that equity in order to live off of it. Say you take $100,000 a year. That money becomes a loan so your interest repayments go up. Hopefully rents are going up as well so that it’s covering the interest repayments. It’s likely that you’re either going to be neutrally geared or slightly positively geared using this scenario but you are actually getting the bulk of your income from accessing equity. This can be tricky if you only own a few properties because the banks will see you as not having any income if you are financially free and just gaining debts. So it would be hard to increase your serviceability and to get more loans without having a job. However people with large portfolios have been able to pull this off. This strategy is extremely common. You purchase a whole group of properties (maybe somewhere around 10 properties over your lifetime) and they go up in value as you own them. Then when it comes time to retire you might sell a portion of those properties and use the proceeds that you received to pay down the debt on your other properties. So if you have a few properties that have a lot of equity you might want to pay them off and use that money to pay down the debt on the highest yielding properties. If you keep those you then have no mortgage and you just collect the rents coming in as payment that helps you pay for your lifestyle. This is a very common strategy. It does require that you own multiple properties though because you need to have a few properties left over after selling some off. But it can be a great way to utilize those capital gains. Just be careful to remember that if you are selling a lot of properties in the same year then you may be paying a lot of capital gains tax. Sometimes people will therefore spread it out and sell one property each year until all of their debt is paid off. Maybe you have 10 different individual investment properties that you purchased over your lifetime. Maybe you sell one of those properties and make $300,000 in profit and then live off that $300,000 for the next three or four years. You then sell the next property, access the growth from that property and then live off of that. Basically over time you’re selling more and more properties and then you are accessing that income and living off of that. 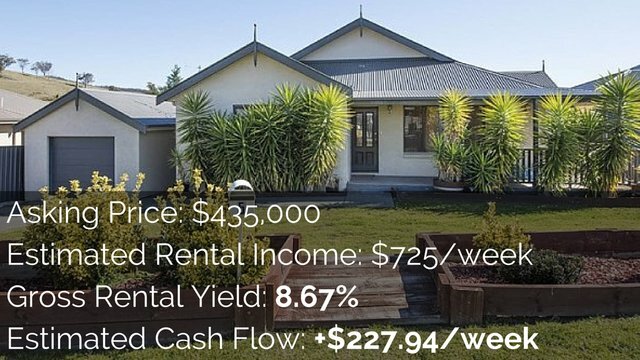 I guess this would be a good strategy if you wanted more income than the passive income these properties are going to generate and you couldn’t get access to loans in order to draw down the equity. Keep in mind though that every time you sell a property you are not going to get any future growth for that property because it’s completely sold. 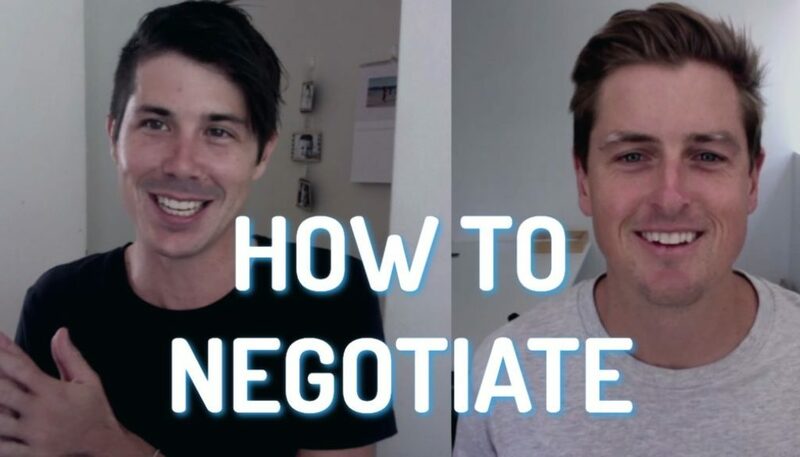 This is the strategy that a lot of people use when they are flipping property or when they are developing property. The people know that when they purchase the property they are going with the exit strategy of selling that property and being free and clear from it. People often rinse and repeat this strategy. They purchase the property and have it done up or do some sort of development to it. Then they sell it and generate a profit from that and then go on and do another investment. Whatever profit that they make would either be used to reinvest or they would use it to fund their lifestyle. There is also an option which is not really common which is to build up a property portfolio then sell all of it and put the money in the bank as cash. Property is generally seen as a pretty stable investment. It is therefore unlikely that people are going to sell their properties (which are generating them positive cash flow) and put them into a bank account (which is probably going to generate less and might be less secure than property because it can be hard to know what will happen to the banks). This strategy is generally used in development or in renovation as a flipping strategy. The final strategy is a bit more technical. Basically rather than selling the property to access all the cash up front you would sell the property to someone and they would assume a loan with you. This loan is generally at a higher-than-market-valuation price and a higher-than-market-valuation interest rate. Therefore you are getting extra passive income and someone is basically paying their mortgage to you. So you are collecting mortgage repayments from other people for a house you used to own but you are selling to them. Again it is a bit technical. I have done a full episode on owner finance which I think will help clarify the subject because I explain exactly owner finance works. 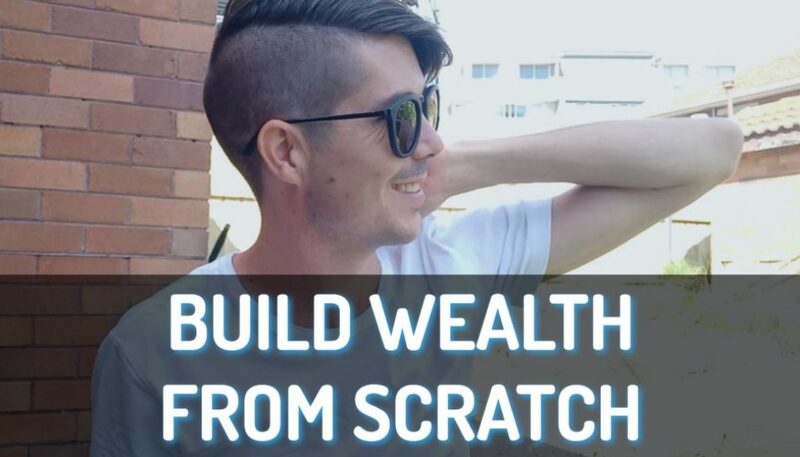 I also made an episode about how you can use owner finance to generate a positive cash flow. 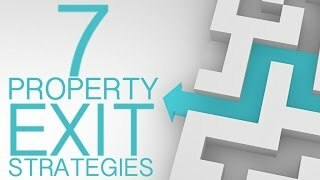 There you have seven different exit strategies for property investment in Australia. 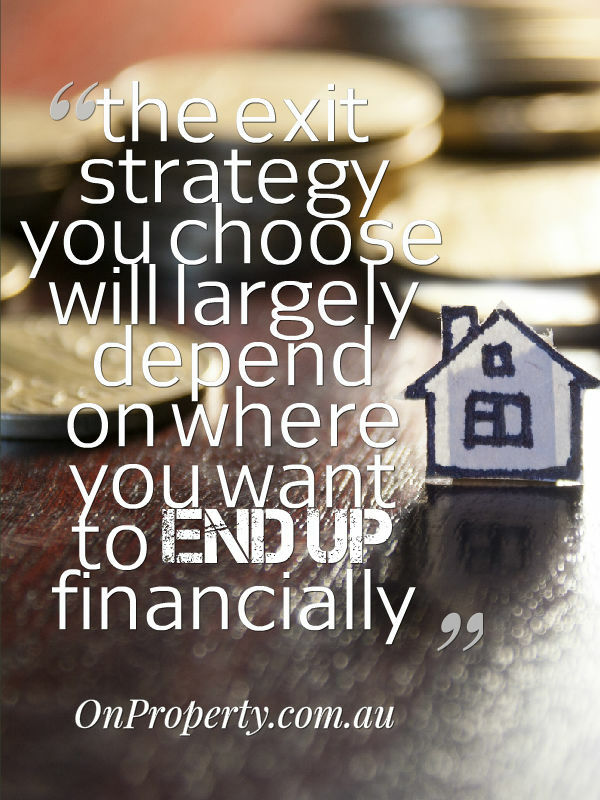 If you can go and invest with an exit strategy in mind then chances are you are going to choose a better property that is more likely to lead you towards your financial goals. I hope that this has helped you Valerio. 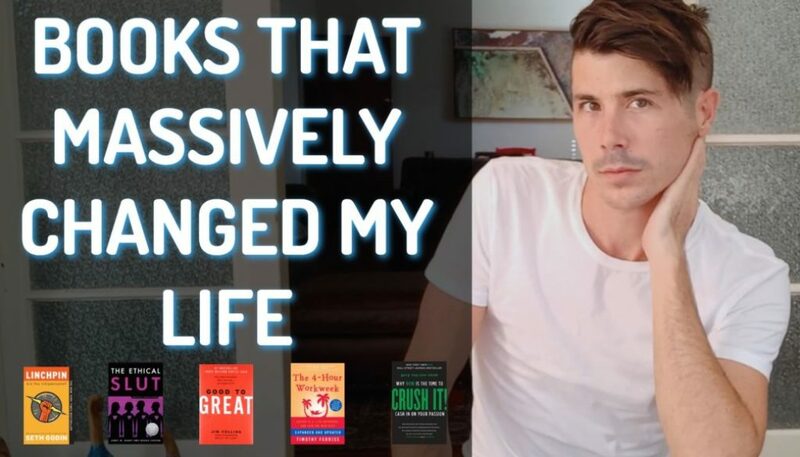 And to everyone out there I hope that these strategies have helped you as well. If positive cash flow property leads you towards your financial goals and you want financial freedom then check out On Property Plus which is my premium membership community. In there I list positive cash flow properties every single day and I also have in-depth training about how you can find and research positive cash flow properties. Until tomorrow remember to stay positive!